Hypokalemia is defined by potassium serum levels below 3.5mEq/L. Patients commonly diagnosed with this electrolyte imbalance include individuals who are on diuretics such as Lasix or laxatives. Other common causes may include chronic diarrhea, vomiting, malnourishment, alcoholism, burns, gastric suction-NG. Individuals with Cushing's syndrome may experience hypokalemia, however those with Guillain Barre syndrome may mimic the signs and symptoms of hypokalemia. Co-morbidities: PMH of Coronary Artery disease. S/P CABG, IDDM, HTN, CKD stage 3. Previous care or treatment: Patient has had multiple hospital admissions for acute exacerbation of systolic heart failure and respiratory distress secondary to fluid overload. Subjective: Patient presented to the emergency department with a chief complaint of feeling short of breath for the past two days. She also states that she is currently on diuretics and has a history of IDDM, HTN, and stage 3 CKD. According to her caregiver and family, she has had difficulty breathing on minimal exertion and constantly appears "winded" even at rest. She reports that she is currently unable to ambulate and has been feeling lethargic for three days. According to her family, since her discharge from the hospital one month ago her respiratory status has not returned to normal. She also reports having a history of muscle cramping in her lower leg but currently there is none present. She has been using 2L of oxygen via nasal cannula and just a few days ago her Lasix dose was doubled to help manage her CHF symptoms. She reports her quality of life has significantly declined in the last month and she now requires 24 hour assistance. Objective: Pt appears to be alert and oriented to person, place and time with no focal neurologic deficit. She appears to be chachectic and in respiratory distress. Pt shows reliance of use with her accessory muscles to assist with breathing and has difficulty completing her sentences. Her vitals exhibit tachycardia, tachypnea, hypotension, hypoxia, audible S1 and S2 sounds, and 3/6 ESM at the right sternal border. Serum potassium: 2.1mEq/L and Magnesium 1.1mEq/L. Upon palpation abdomen was soft and non-distended. Pulses in the lower extremity were diminished bilaterally to +1. Gross MMT: UE: Shoulder abduction: 2-/5Bilat. ; Shoulder flexion: 2/5 Bilat. ; Shoulder Extension: 2-/5 Bilat. ; Elbow Flexion: 2+/5 Bilat. ; Elbow extension: 2/5 Bilat. ; Wrist Flexion: 3+/5 Bilat. ; Wrist Extension: 3+/5 Bilat. ; and Grip strength: 3+/5 Bilat. Patient is lethargic and has difficulty breathing on minimal exertion (appears winded at rest). Patient exhibits a decrease in overall muscle strength and diminished reflexes in the LE. Patient is unable to ambulate due to weakness and fatigue. Patient is unable to complete simple task due to fatigue and respiratory distress. Based on the patient's subjective and objective findings, patient's cardiopulmonary complications and co-morbidities have lead to an exacerbation of her CHF and hypokalemia in symptoms. The targeted interventions include replacing potassium via IV and monitor for other possible electrolyte imbalances. The patient's diuretics should be monitored accordingly since it may lead to unwanted side effects such as this. The goal is to make patient euvolemic, and if the patient is unable to do so with diuretics a nephrologist should be consulted for possible for hemodialysis. Upon discharge the patient will need potassium supplements in accordance with her loop diuretic therapy. BMP will need to be re-checked in 1 week and the patient should be referred to a heart failure clinic or rehab in one week for monitoring. Replace the potassium via IV, correct all the electrolyte abnormalities, and continue diuresis for fluid overload. Deep breathing, postural drainage (precaution for pulmonary edema), percussion and vibration, strength and mobility exercises. Hypokalemia is not managed primarily by a physical therapist. Physical therapists should be mindful of common signs of symptoms of hypokalemia when working with patients. Due to muscle weakness and cramping, exercise is not effective during the initial state of hypokalemia. After proper medical intervention is incorporated, muscle strength typically returns to normal. Patient is typically on bed rest by physician's order until Potassium levels have normalized. Once potassium levels have normalized, physical therapist will reassess the patient. Before ambulating patient from bed, physical therapist will continue to monitor vitals throughout treatment session. Therapist should address any impairments and functional deficits patient may display during treatment session. Since patient presents with respiratory insufficiency, PT is encouraged to perform exercises and educate patient on breathing exercises to improve oxygen consumption and energy conservation. PT should assist physician in deciding if the patient should return back to nursing home or be referred to skilled nursing facility for further treatment and monitoring. Phase 1 - Since patient is suffering from pulmonary edema secondary to acute hypoxic respiratory failure, physical therapy will assist pt on breathing exercises, postural drainage (precaution for PE), vibration and percussion. Educate patient on deep breathing and sitting posture to minimize the fluid accumulation. Phase 2 - Patient is classified as NYHA class 3 meaning patient has marked limitation of physical activity. She is comfortable at rest but less than ordinary activity causes fatigue, palpitation, dyspnea or anginal pain. Physical therapy should be aware of these symptoms and get the patient out of bed to work on mobility. Physical therapy will monitor O2 sats before, during, and after the treatment sessions and patient will be able to rate their fatigue level on Perceive Level of Exertion Scale. Physical therapy will teach and educate patient on energy conservation technique. Phase 3 - Usually patients with pulmonary edema have an average stay of 5-7 days. During this time physical therapy should work with patient everyday to improve their physical limitations while monitoring vitals and fatigue levels. Deep breathing, percussion and vibration: Initiate first with deep breathing exercises. Percussion and Vibration 3-5 minute per segment, perform on most congested area on first day. Follow with deep breathing, coughing, suctioning as needed. Aerobic: low impact and short distance ambulation as per patient's tolerance. Progress to longer distance and stairs while monitoring O2 sats and patient's fatigue levels. Strength: In-bed exercises to strengthen weakened muscles and increase blood flow throughout body. Exercises may include ankle pumps, isometric quad/hamstring contractions, heel slides, straight-leg raises, glute isometrics, 4-way Thera-band hip flexion, abduction, adduction, and extension: 2-3 sets x 10 reps (or to patient tolerance). Goal is to progress patient to or near their prior level of function. Increase endurance to decrease fatigued levels and improve quality of life. Increase patients activity tolerance level while minimizing NYHA classification level. According to the physician's recommendation, patient was treated with potassium chloride, magnesium sulfate, and lasix. Patient's potassium levels were normalized in about 4 hours. According to Turcotte et al., treatment of any acute episode of muscle weakness includes providing a secure airway, effective ventilation, and circulatory stabilization. Normalization of potassium may include an oral supplement of 0.2 to 0.4 mmol/kg every 15 to 30 minutes over 1 to 3 hours with a total dose nto to exceed 200 mEg in 24 hours in order to avoid rebound hyperkalemia and its associated sequelae. 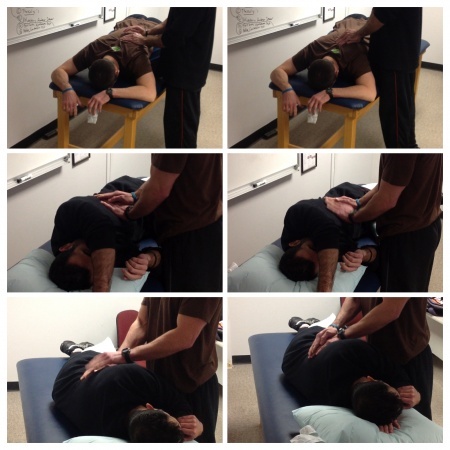 Gross MMT: UE: Shoulder abduction: 4/5Bilat. ; Shoulder flexion: 4/5 Bilat. ; Shoulder Extension: 4-/5 Bilat. ; Elbow Flexion: 4/5 Bilat. ; Elbow extension: 4-/5 Bilat. ; Wrist Flexion: 4/5 Bilat. ; Wrist Extension: 4/5 Bilat. ; and Grip strength: 4+/5 Bilat. Sensation: Normal, slight edema still noted on the ankles. Bed Mobility: Pt able to perform bed mobility transfers (rolling, sitting edge of bed, supine to side-lying to prone to side-lying and supine) in both directions independently. Transfers: Pt able to perform transfer from chair to bed and bed to chair with contact-guard assistance. Posture: Pt's posture presents with forward-head and rounded shoulders, kyphotic posture noted. Patient is able to weight bear evenly on both feet. Static Stance: Pt able to stand for 25 seconds with contact-guard assistance before postural sway was noted. Gait: Pt presented with slow steppage gait pattern with and without use of cane. Pt still remained in kyphotic posture with limited arm swing and trunk mobility. Ambulation: Pt able to ambulate 43 feet down the hall before becoming fatigued and HR increased by 15bpm. After sitting and resting for two minutes pt was able to return to her room without any complications. Unless lab values are obtained, the presentation and diagnosis of hypokalemia can be hard to detect and differentially diagnose in some individuals. For patients who have had a history of these attacks, they will eventually become familiar with the symptoms and be able to intervene appropriately by taking prescribed potassium pills/fluids or reporting to the hospital. Although this patient developed hypokalemia secondary to other medical complications and co-morbidities, it is imperative that therapists and other health professionals be aware of the signs and symptoms of this treatable electrolyte imbalance before it becomes fatal. Initially the patient presented with decreased reflexes and muscle strength. Within a few hours after receiving the appropriate care, the patient's levels were able to normalize and previous strength was regained. Hypokalemia also affects the respiratory system and can lead to shallow breathing and tachypnea which can be distressful to the patient. With education, therapy, and proper medications the symptoms of hypokalemia should improve along with respiration. According to Allen et al, evidence has suggested that mild exercise, such as a few minutes on a stationary bike or treadmill before bedtime, can relieve nocturnal leg cramps. If muscle fatigue is a cause, graded exercise and/or physical therapy might be of benefit for some patients. 1. Lonnemann, E. (2015) Pathophysiology of Complex Patient Problems: Fluid and Electrolyte Disorders Powerpoint, Bellarmine University. 2. Jackie et al. ( 2013) 'Hypokalemic Periodic Paralysis: Two Cases of Profound Weakness', Air Medical Journal, 32(4), pp. 181-183. 3. Goodman, Catherine Cavallaro, and Snyder, Teresa E. Kelly. Differential Diagnosis for Physical Therapists: Screening for Referral, 5th ed. St. Louis, MO: Saunders/Elsevier; 2013. 4. Medline Plus. Low potassium level. http://www.nlm.nih.gov/medlineplus/ency/article/000479.htm (accessed 27 March 2015). 5. Allen, R et al. (2012) 'Nocturnal Leg Cramps', American Family Physician, 86(4) pp. 350-355. 6. World Health Organization. Towards a Common Language for Functioning, Disability and Health ICF. Geneva, Switzerland: ; 2002. 7. American heart association (2014) Classes of heart failure, Available at:http://www.heart.org/HEARTORG/Conditions/HeartFailure/AboutHeartFailure/Classes-of-Heart-Failure_UCM_306328_Article.jsp(Accessed: 29th March 2015). ↑ 1.0 1.1 1.2 1.3 1.4 1. Lonnemann, E. (2015) Pathophysiology of Complex Patient Problems: Fluid and Electrolyte Disorders Powerpoint, Bellarmine University. ↑ 2.0 2.1 2.2 2.3 Jackie et al. ( 2013) 'Hypokalemic Periodic Paralysis: Two Cases of Profound Weakness', Air Medical Journal, 32(4), pp. 181-183. ↑ 3.0 3.1 3.2 Goodman, Catherine Cavallaro, and Snyder, Teresa E. Kelly. Differential Diagnosis for Physical Therapists: Screening for Referral, 5th ed. St. Louis, MO: Saunders/Elsevier; 2013. ↑ 4.0 4.1 4.2 Medline Plus. Low potassium level. http://www.nlm.nih.gov/medlineplus/ency/article/000479.htm (accessed 27 March 2015). ↑ 5.0 5.1 Allen, R et al. (2012) 'Nocturnal Leg Cramps', American Family Physician, 86(4) pp. 350-355. ↑ World Health Organization. Towards a Common Language for Functioning, Disability and Health ICF. Geneva, Switzerland: ; 2002. ↑ 7.0 7.1 American heart association (2014) Classes of heart failure, Available at:http://www.heart.org/HEARTORG/Conditions/HeartFailure/AboutHeartFailure/Classes-of-Heart-Failure_UCM_306328_Article.jsp(Accessed: 29th March 2015).